The figures presented below cannot be considered as official scientific data. This information is partial as all the stations are not involved in this investigation. It will be completed with informations from the CRBPO database. The figures given do not represent the reference values for the years 2017 and 2018! 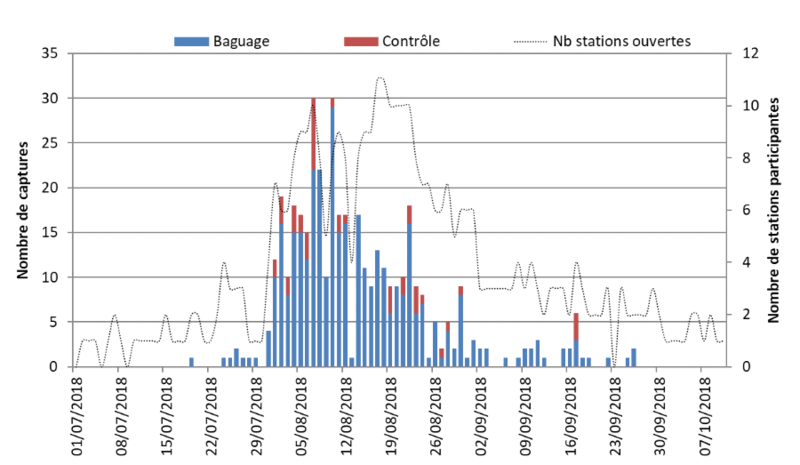 Again this year, Bretagne Vivante proposed to follow in real time the monitoring of the migration of the Aquatic Warbler in France using ringing data. Participation was lower than last year with 4 stations participating in the web survey in July, 14 in August compared to about 20 in 2017, 4 in September and 2 in October. The number of Aquatic Warblers captured is 412 (44 controls including 3 Belgian, 2 Polish, 1 French) between July 19 and September 26. 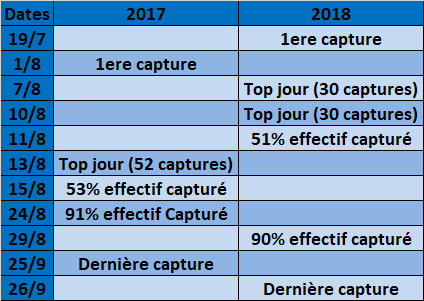 In 2017, the number of captures amounted to 440 between August 1st and September 25th (data from the 2017 web survey / Number of stations and catch pressure are not comparable). 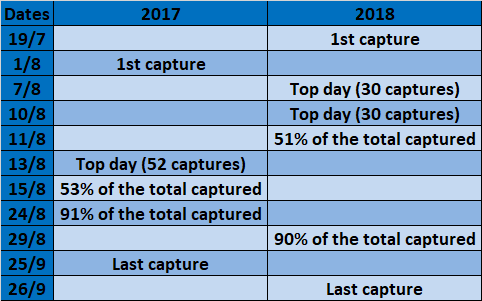 The maximum number of catches in 2018 are recorded on august the 7th and 10th compared to the 13th of August in 2017. Hubert Dugué told us that for the station of Donges the month of August 2018 was quite exceptional. 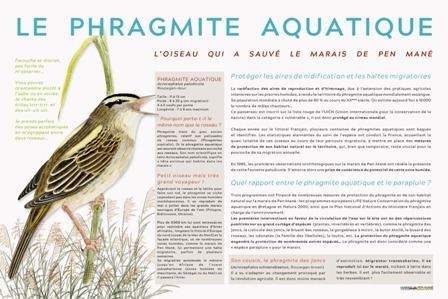 Booklet on the Aquatic Warbler Acrocephalus paludicola : suitable habitats, VOL.I. It’s almost done ! It’s been a while that we first talked to you about it!! One more proofreading effort and it will be done! In the end, the brochure is a booklet. 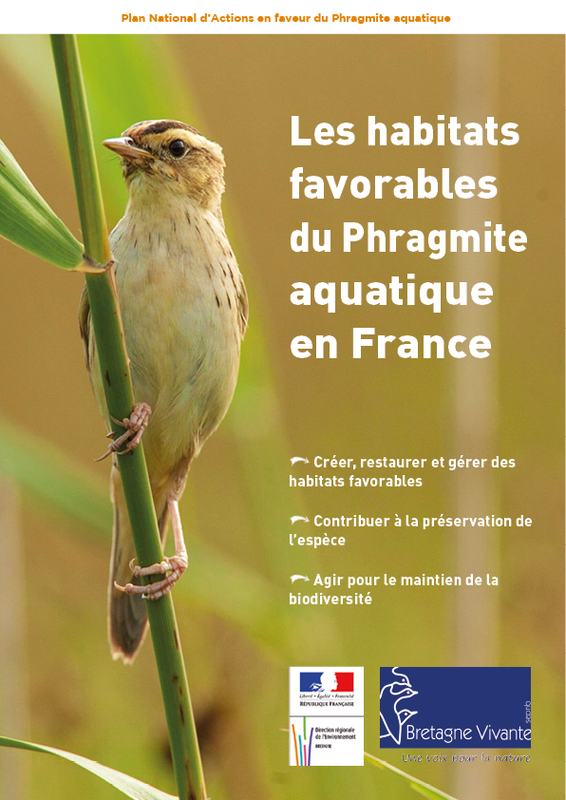 This document outlines the ecology of the Aquatic Warbler during postnuptial migration in France. It is mainly dedicated to support managers of natural areas in their work. We would like to thank all of the people who contributed to the illustrations and proofreading. Volume II will follow shortly. It will be mainly dedicated to the species' preferential habitats. It will also take the form of a booklet with a dichotomous key, technical sheets by habitat and management advice by main habitat type. This document is directly inspired by the table of habitats used so far, with a botanical dimension. 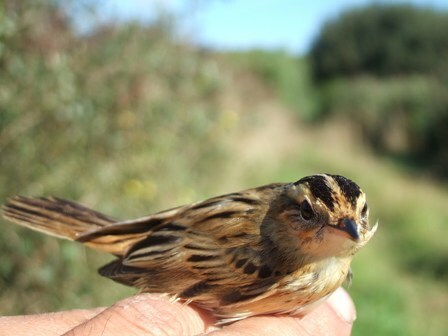 Public awareness: How did the Aquatic Warbler save a small coastal marsh in Morbihan? One of the sites that has done the most work in terms of restoration, habitat conservation and public communication in Brittany is the site of Pen Mané (Locmiquélic, Morbihan). The educational trail has just been rearranged. 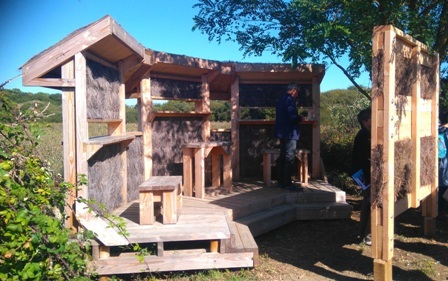 Awareness-raising panels have been created and installed on the site and the Aquatic Warbler occupies an important place on it. Indeed, it is thanks to this passerine that the marsh was saved and benefits from the attention of all. An example to follow. In France, migration monitoring was quite good or even exceptional for some stations. It would be easy to think that this is due to a prolific spring for the species. Is it the real reason?
" Our impression in Belarus and Lithuania was, that despite of strong decline in water level during June/July the breeding success was extraordinarily good. This was mainly due to weather (high pressure sunshine all the time, only very short interruptions with rain) and the very high abundance of insects, especially dragonflies and grasshoppers. So there was plenty of food, but no weather-induced brood losses. 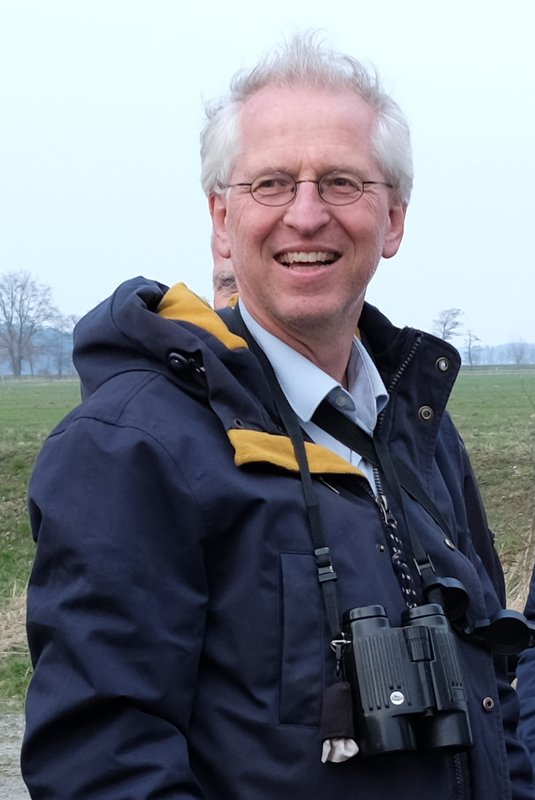 Thus the total productivity of AW was obviously very high, at least in the western and northwestern part of the breeding range" " (Martin Flade).
" The park continues to have control over water management and can therefore flood marshes and grasslands adequately for the complete wintering of Aquatic Warblers. The vegetation is maintained by cattle from villages near the park in order to maintain low and homogeneous grasslands. Park officers work alone or with villagers to control invasive helophytes such as Typhas. Apparently the management of the site is adequate and should allow good wintering conditions for Aquatic Warblers for years to come. According to the latest publication by Salewsky et al., it is probably mainly Polish birds that spend the winter in Senegal, while the more eastern populations tend to go to Mali." 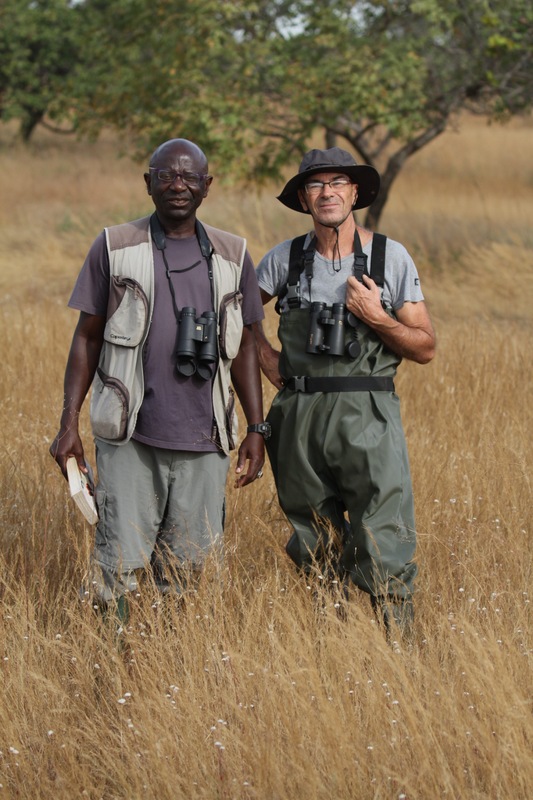 It's Bruno's turn to finish by pointing out that he still hasn't found the species in Casamance but that he doesn't despair ! Musseau R., Crépin M. & Brugulat C. (2018) - BioSphère Environnement, 15 pp. An article based on this work will be published in an international scientific journal. 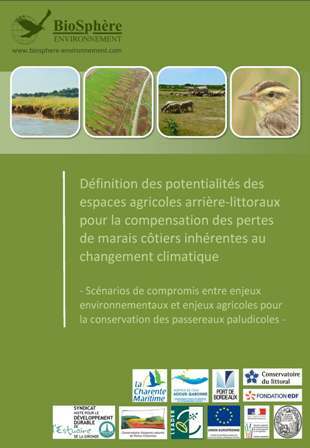 In the context of the reduction of coastal marsh areas inherent to global change, we sought to assess the possibilities to maintain habitats used by reed passerine birds by setting up reed beds and low reed beds (parvo roselière) in rear-littoral areas within harvested and grazed meadow areas. On the northern shore of the Gironde estuary (France), we compared the conditions of use of these areas by four species of reed passerines birds that have different ecological requirements with the use of vast reed beds and low reed beds (parvo roselière) in a foreshore area that is freely subject to tidal sway. During the breeding season, the densities per hectare of reeds of the Eurasian Reed Warbler are nearly twice as high in the first habitat.During the post-breeding period, the residence times of young birds (after capture), calculated on the basis of the average survival probabilities of individuals, vary more or less according to species between the habitat mosaic of the meadow zone and the foreshore zones. 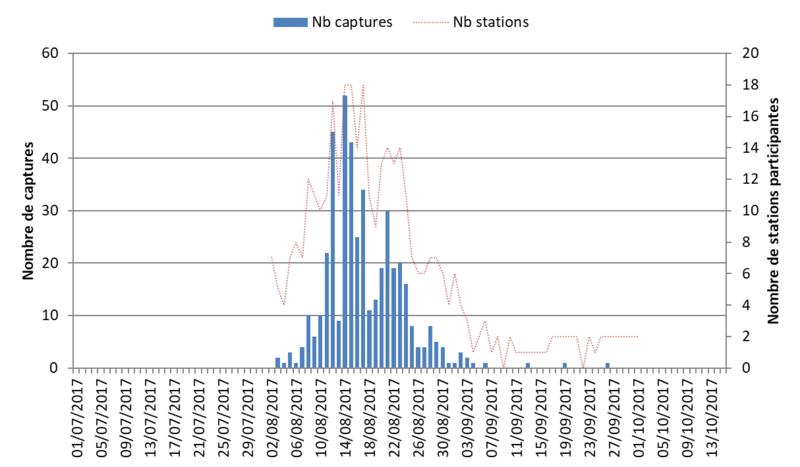 For the Aquatic Warbler, radio-tracking data show a very rapid dispersion of birds over the first habitat while they can be monitored for up to 4 days over the second one. Salewski V., Flade M., Lisovski S., Poluda A., Iliukha O., Kiljan G., Malashevich U. et Hahn S.
Birds that are long-distance migrants partition their annual cycle among a number of locations over a large spatial range. The conservation of these species is particularly complex because it requires attention to a number of different and distant habitats based on knowledge of migratory phenology, routes and staging areas. In the case of the globally threatened Aquatic Warbler Acrocephalus paludicola, a habitat specialist that breeds in Europe and spends the boreal winter in sub-Saharan Africa, nonbreeding staging areas were widely unknown until recently. You can find the summary in English or French on the website under the heading documentary database. “In the meantime, 60 new birds have been equipped with a new generation of light-level geolocators (lighter, with improved technology) in northern Belarus and Lithuania. Let's hope that we will find many of them again in May / June next year (2019 tn)". Martin Flade. For the first trimester of 2019, we plan to prepare a newsletter focusing mainly on the management measures undertaken in 2018. Tell us about your different experiences (problems, means implemented, duration of the work, valuation, photographs, and everything else that seems relevant to you). In order to complete the documentary database dedicated to the Aquatic Warbler, do not hesitate to send us your activity reports for 2018 and previous years if this has not been done. Thank you for your contribution. Happy 2019 to all, long live the Aquatic Warbler! Find the newsletter in your browser with all active links by going to the page "News"